For a cyclist, staying safe means reducing the chance of collisions. Cyclists are particularly vulnerable. Even relatively minor altercations with larger heavier vehicles can result in serious injury or death. Yet, statistically, a person is no more likely to be hurt or killed on a bicycle as long as that person engages in safe cycling behaviour. That means taking precautions that will help avoid collisions. One way to avoid collisions is to ensure that other road users can see you and are aware of your presence on the road. Imagine the chaos if cars travelled after dark with no lights. Yet, despite it being the law in Ontario, Brampton cyclists are often out after dark wearing dark clothing with no bike lights! 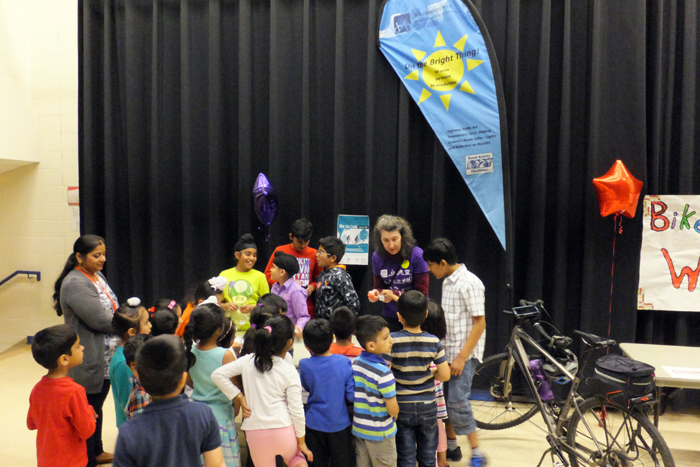 So BikeBrampton decided to use the grant they received through this year’s MTO Road Safety Challenge to shine a light on cyclists’ visibility. 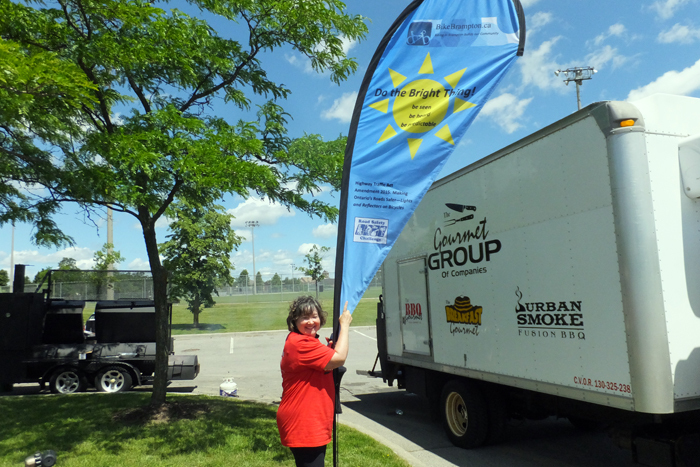 The campaign called “Do the Bright Thing” involved the design and display of a large flag, along with educational aids designed to help Brampton cyclists be seen, be heard and be predictable. 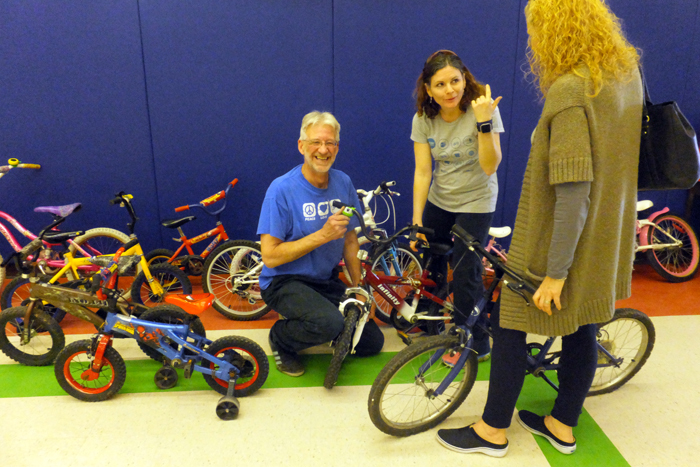 The campaign kicked off in April with a Bike Donation Drop Off Tune Up event at Massey Street Public School, where local families donated bikes for a swap two weeks later. Rain and cold did not dampen the kids’ spirits at the Baskets and Bunnies event at Chinguacousy Park, when dozens stopped by for safety advice after visiting the MOO Barn. 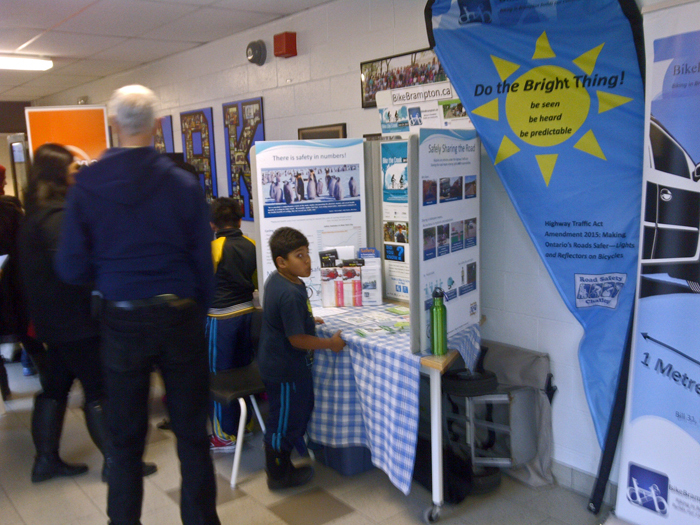 We had good discussions with parents and students during Clark Boulevard Public School’s Family Fitness night. 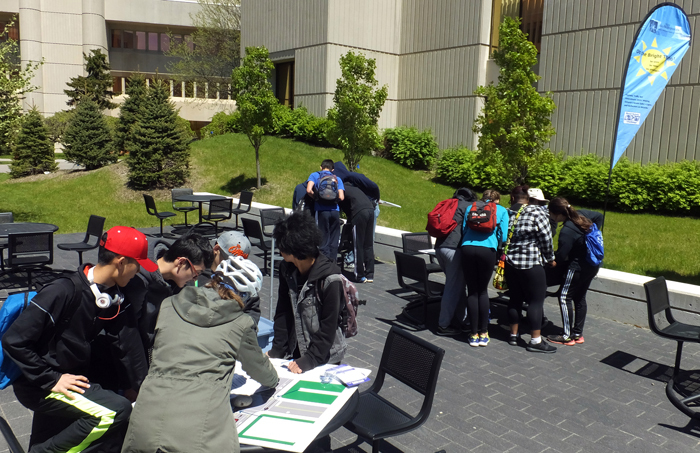 The next day we participated in a National Youth Week event at Louise Arbour Secondary School where we helped students understand the importance of physical activity for mental health maintenance, particularly safe cycling for transportation! After that it was off to support PEYA’s Amazing Green Race where the BikeBrampton display and race station was located at University of Toronto’s Mississauga campus. More than three dozen students took our Road Safety Challenge Intersection Quiz. 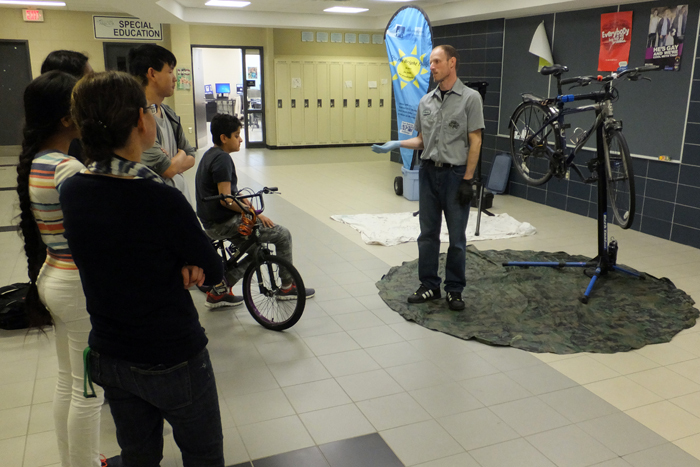 Next we delivered a Bike Repair workshop at Louise Arbour Secondary School followed by Bike to School Week events at St. Leonard’s Elementary School, Conestoga Public School and Great Lakes Public School. The children at Great Lakes Public School delighted in demonstrations of lights to “be seen” and bells to “be heard”. 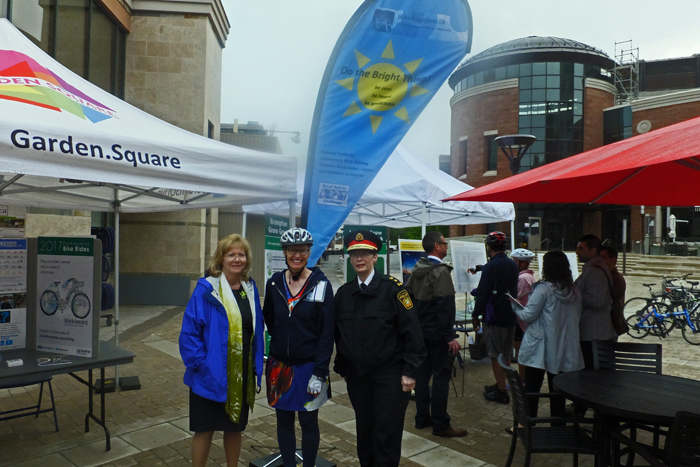 Then it was on to Bike to Work Day where many riders dropped by Garden Square in Brampton’s downtown for free coffee and breakfast. We were pleased to display our “Do the Bright Thing” flag to Brampton Mayor Linda Jeffrey and Peel Regional Police Chief Jennifer Evans. 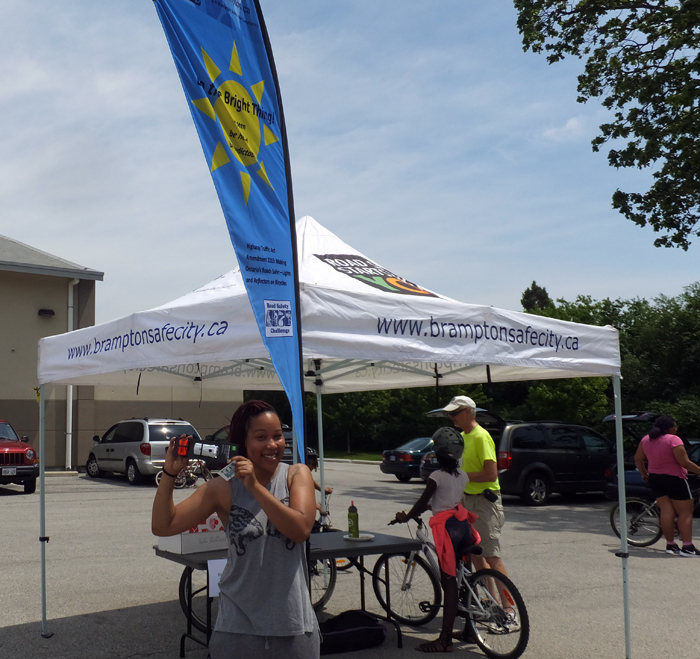 Bramalea Cyclefest was a hit this year with more than 200 participants riding the Chinguacousy Trail followed by lunch. 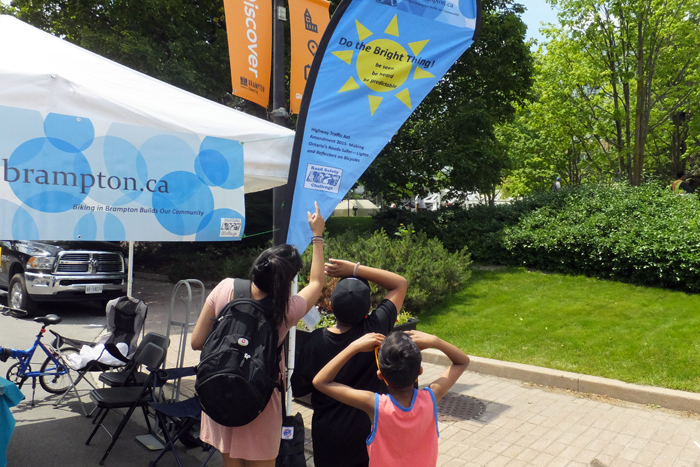 We stopped off during our ride at Manitou Park Bike Parade, to see another of our BikeBrampton’s booth and join the smaller children for their parade. 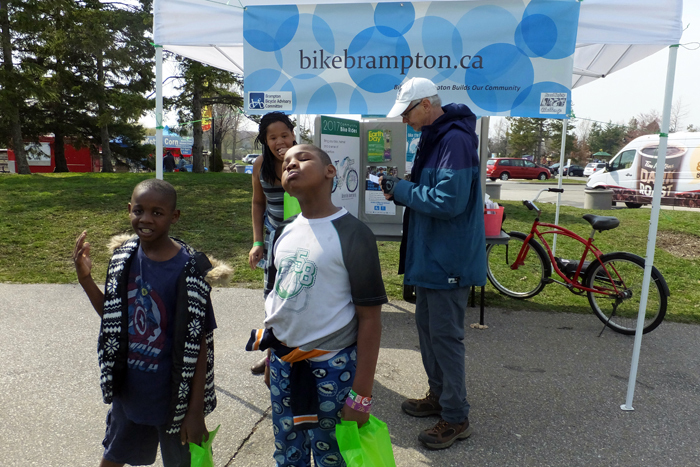 CeleBrampton BikeFest was another recurring event where dozens of visitors dropped by the BikeBrampton display to learn how to “Do the bright thing”. We asked children what each of our 3 points meant to them. Be seen — Be heard — Be predictable! Their responses were thoughtful and correct! One child said being predictable meant using hand signals and not weaving in and out between parked cars. Bike the Creek 2017 was the biggest Bike the Creek event ever with more than 630 participants traveling along 5 cycling routes throughout Brampton and parts of Caledon. We were honoured to have Minister of Natural Resources and Forestry Kathryn McGarry cycle and speak at our event. Here she is pointing to our “Do the Bright Thing” flag, that welcomed people to our event. 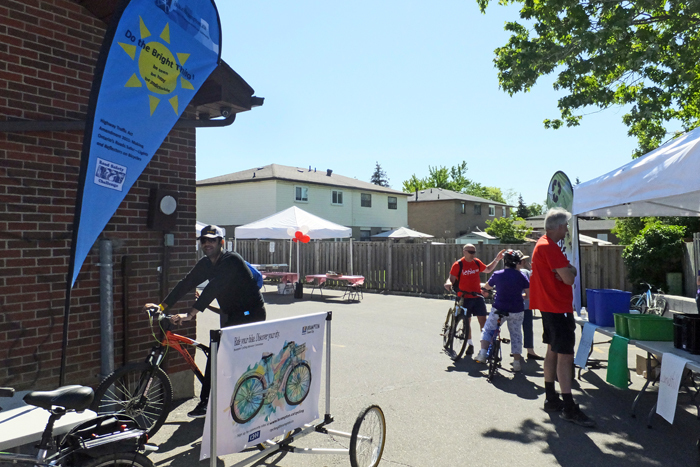 The campaign moved on to McMurchy Bike Festival where local residents had bikes repaired, participated in the bike rodeo and took our Road Safety Challenge to “Do the Bright Thing”. BikeBrampton wrapped up the campaign, for this year at least, at the Mount Pleasant Farmer’s market where we successfully vied for attention competing with high winds, thunderstorms and spun candy! All in all this year’s campaign was well received with many favourable comments and folks who committed to “Do the Bright Thing” while riding their bikes this summer.